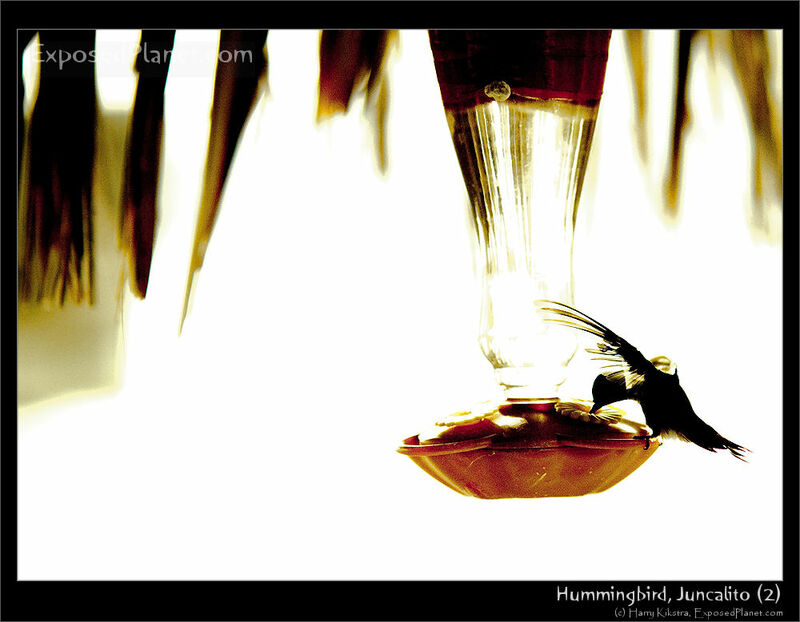 The story behind "Hummingbird feeding in Baja California"
When staying at a friend’s house in Southern Baja California, at the Sea of Cortez, I noticed several small birds racing from one artificial feeder to flowers and then to other feeders. I guess it helps them survive in the desert conditions, but the nervous flight patterns make it very hard to take a photo. Due to their incredible wing speed I used 1/8000 of a second shutterspeed in order to freeze the fragile, back-lit wings… (see the ‘Exif” button above for all technical info of any photo on ExposedPlanet.com). So this one is out of respect for all the bird-photographers who bring us those amazing shots! ” They are among the smallest of birds, and include the smallest extant bird species, the Bee Hummingbirds. They can hover in mid-air by rapidly flapping their wings 12–90 times per second (depending on the species). “With the exception of insects, hummingbirds while in flight have the highest metabolism of all animals, a necessity in order to support the rapid beating of their wings. Their heart rate can reach as high as 1,260 beats per minute, a rate once measured in a Blue-throated Hummingbird. They also consume more than their own weight in nectar each day, and to do so they must visit hundreds of flowers daily. Hummingbirds are continuously hours away from starving to death, and are able to store just enough energy to survive overnight.